A viewer named Aga was inspired by the crepe video, and made this very delicious looking crepe dessert. Unfortunately, Aga didn’t tell me exactly what was in it, so my CSI-like food analysis team enhanced the photo, and ran a few tests, like a color spectrometer pixilation frequency scan, as well as a algorithmic variable waveform extraction. When neither test resulted in a positive ID, they just looked at the photo and guessed it was ice cream, bananas, whipped cream, and caramel sauce. Thanks to Aga for sending in the photo, and if you have pictures to share of your Food Wishes inspired recipes, please send them in! The uncertain result from your CSI team is very positive indeed. There are some strawberry slices hidden also. 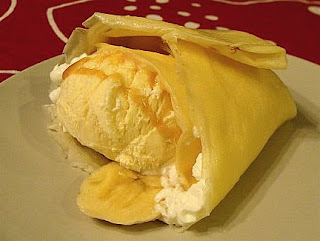 In fact, this kind of crepes is very popular in Japan. For your reference, here's a video of a Japanese style crepes stall in Tokyo, Japan. I tried Google and YouTube's search, but this link is not working. Please check it for accuracy. Thanks. I just checked and it worked fine. (&feature=related) was missing in the original. Why can't I just click on the link within the comment form? That sure makes it easier than to copy/paste into a browser. Who knows? What do I look like some kind of tech nerd? You'll have to copy and paste...and be careful, don't pull a muscle! Chef John..come on now "color spectrometer pixilation frequency scan" ...Really. We all know you are not a techie, I believe you actually use Voodoo. Thats why there is a dead chicken in so many of your videos. We can handle the truth but we don't need it. Just keep up the fantastic work!